Water is about 850 times the density of air, which helps explain why windsurfing fins are one of the most important - although underestimated - components of our gear. Have you ever wondered how a fin's outline, rake, thickness, material flex and twist influence your ride? If so read on! We'll walk you through all the important parameters to help you make the right fin choice whatever your board and rig combination. 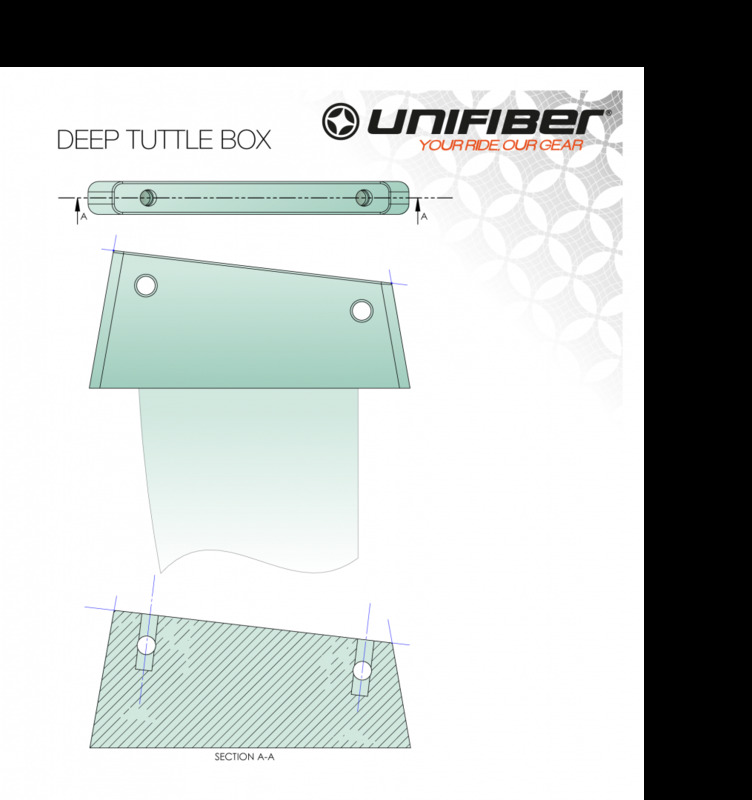 Deep Tuttle Box – A similar head shape to standard Tuttle, but extends higher for additional strength. This makes Deep Tuttle suitable for boards that use larger fins and have thick tails - typically light wind slalom and Formula racing models. Deep Tuttle is the usual standard for fins in the 45cm to 70cm range. 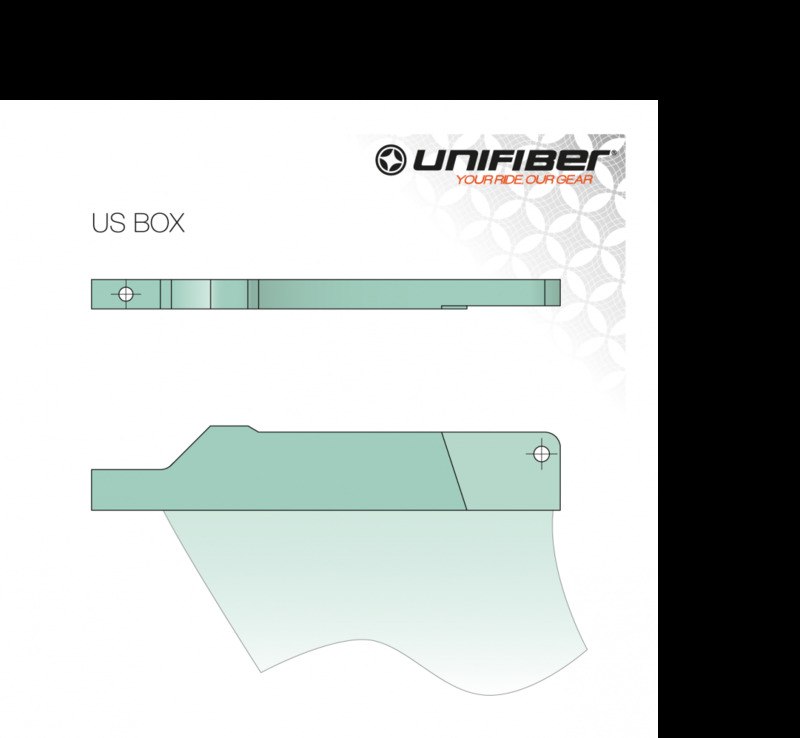 Trim Box - No longer in production and you'll most likely only encounter this style box on older BIC and Fanatic boards. 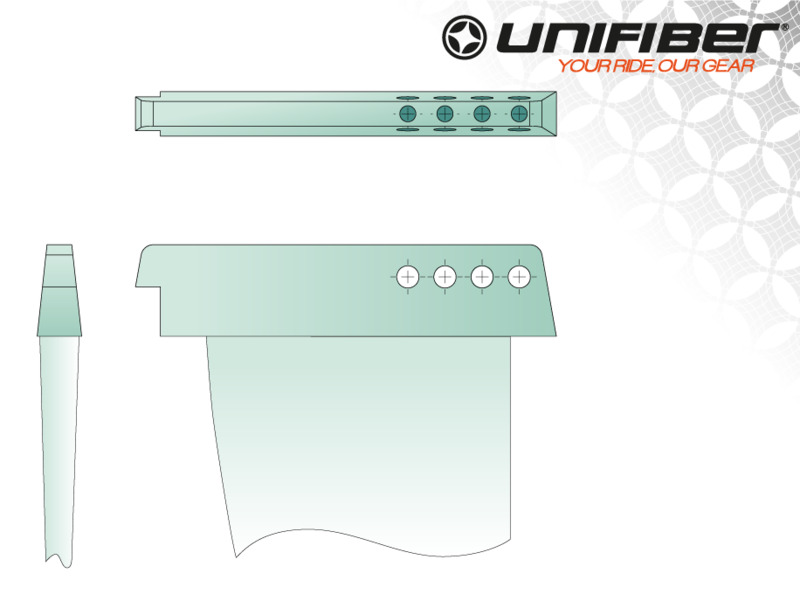 Trim box fins can be positioned fore and aft which has tuning advantages. Accommodates fins up to around 50cm. Multi Conic Box - Is a universal system that uses head adaptors to fit the other box systems (Powerbox, Tuttle, Trim...). 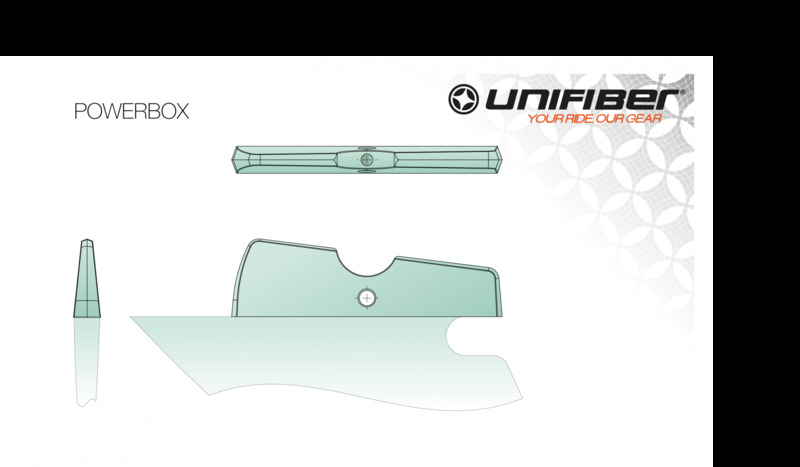 The Multi Conic Box system allows you to fit the same fin in boards with different box systems. This isn't a system in widespread use - almost all fins are now fixed head. 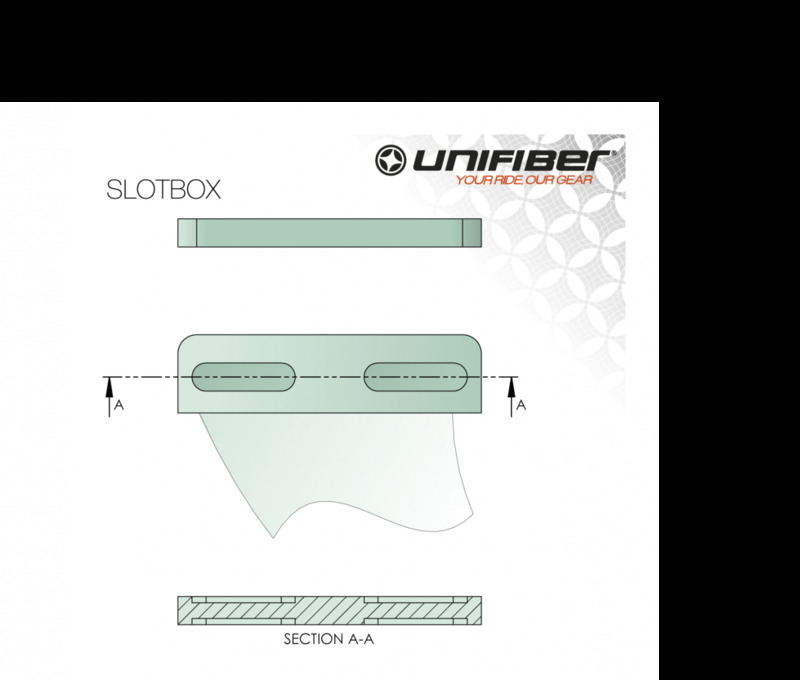 Slot Box – Is a light weight surfing-style box with twin recessed screws on the underside of the hull that enter at an angle to secure the fin. It is a popular system on multi-fin boards. Fin attachment is less secure than with bolted systems, meaning that grounding on rocks can cause fins to pop out (or partially dislodged - there is a good chance the fin will not be lost). This is a popular system on modern wave, freestyle and freestylewave boards sailed with shorter fins. Usable with fin lengths of up to around 19cm. 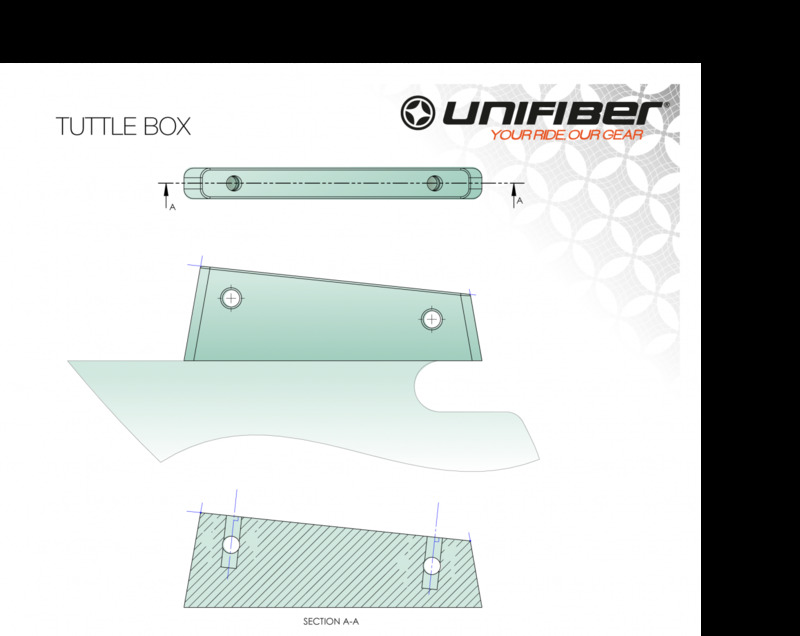 By lift we mean the power that a fin generates through the speed and direction of travel of your board. Increased board speed and/or fin angle results in more power. If your fin is generating lots of power you can push hard against it. But the moment you push too hard you will overpower the fin and it will 'spin out'. So at low speed / low power don't push too hard! There are many fin design factors that influence lift. These include surface area, profile (thickness), profile form (wing shape or camber: the shape of the fin in cross-section), chord (leading edge to trailing edge distance), depth top-to-bottom, profile ratio (chord length divided by thickness, expressed as a percentage), stiffness, twist and so on all play their part. Both the profile form and profile ratio are normally optimized for the use and intended speed range of a fin. For a given speed, a higher profile ratio (a 'fatter' fin) will generate more lift than a lower profile ratio - but at a cost of higher resistance. To achieve good speed in our chosen discipline we look for the right compromise of high lift with low resistance. Lift increases as square of velocity (if speed doubles, lift will increase by a factor of four). Lift increases linearly with angle of attack. Higher profile ratio = more lift per a given fin area. 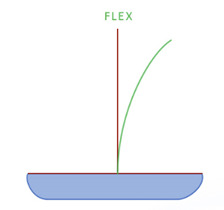 Increased rake = less lift (for example, a weed fin with 45 degree rake delivers considerably less lift than a slalom fin with 12 degree rake). When your fin is too short it will not lift the board enough, the board will be reluctant to 'unstick' from the water, and you will struggle for speed. When your fin is too long it will deliver too much lift making the board difficult to control. Refers to the cross-sectional shape. Since windsurf fins have to work in both directions, the foil cross-section shapes we use are symmetrical This contrasts with the foil shapes used, for example, in aeroplane wings. The position of the foil section wide point, and the ratio of the length to thickness (profile ratio), are the most important parameters for our concerns. Further forward wide points and larger ratios give more accessible lift and are most suitable for freeride sailing. Foil efficiency - lift to drag ratio - is determined in part by the operational speed range and foil profile characteristics. It is a highly complex area and major corporations (also NASA, Formula1, etc.) invest heavily in pursuit of optimally efficient foils! At higher speeds thinner foils normally show a higher efficiency. So thinner foils are better suited once at higher speeds; but it may be more difficult to reach those higher speeds in the first place! 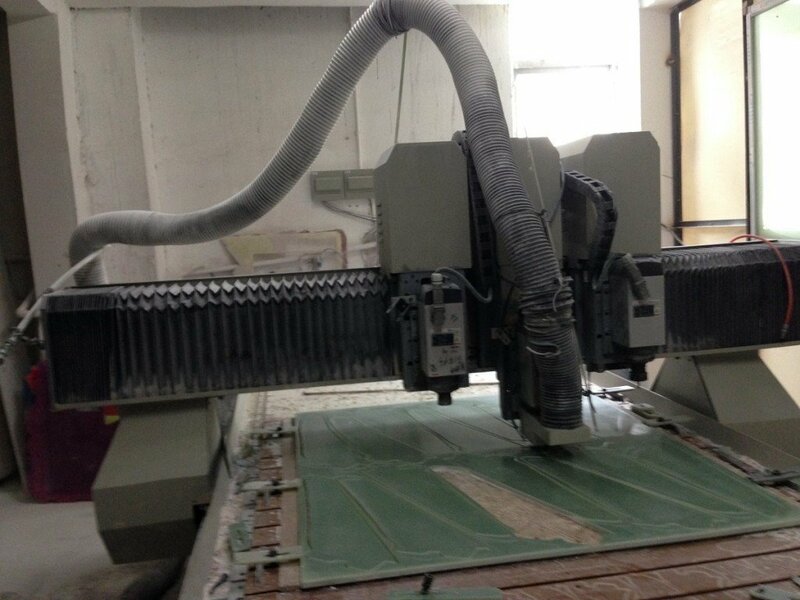 For windsurf fins we find that there is a cut off point of around 9% (chord divided by thickness). Below 9% is typically suited for speed. 9% or a little higher is suited for slalom and general use. Greater than 12% works best with fins to be used at low speeds, such as for learning or non-planing conditions. Refers to the fin outline. Race orientated fins usually have a long, upright and narrow plan shape. Manoeuvre orientated fins are often swept back and curved like a dolphin fin. Fins with a little bit of curvature are recommended for freeride use. Upright fins are particularly suitable for slalom. If you would draw the outline of the fin on a sheet of paper, the surface area of the paper inside the lines (measured in square cm) is equal to the area of the fin. A larger area means more lift. 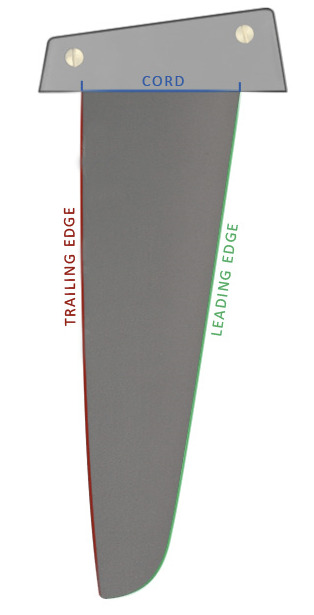 Leading edge to trailing edge width of the fin which is mostly related to the chosen profile. The aft edge nearest the board’s tail. Always quite sharp for a clean, efficient release. The edge nearest the nose of the board. It should be nicely rounded for spin-out free performance. Sideways movement of the fin under load. Side-to-side movement over the chord length. 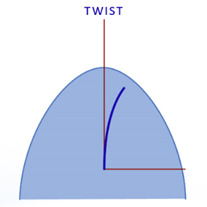 Both flex and twist can be controlled to some extent by the materials and build process of the fin. 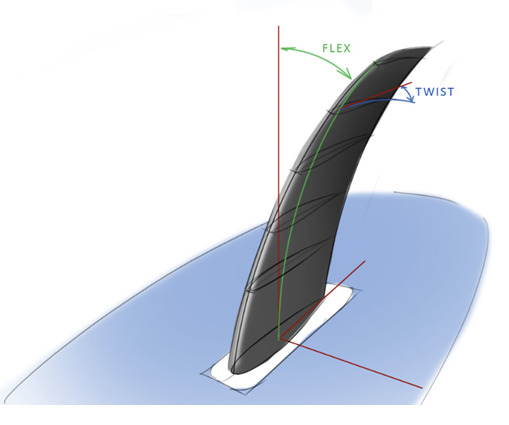 For high performance race fins flex and twist are critical parameters. For freeride fins some twist and flex will add to easier riding. The degree of angle that the fin slopes backwards. 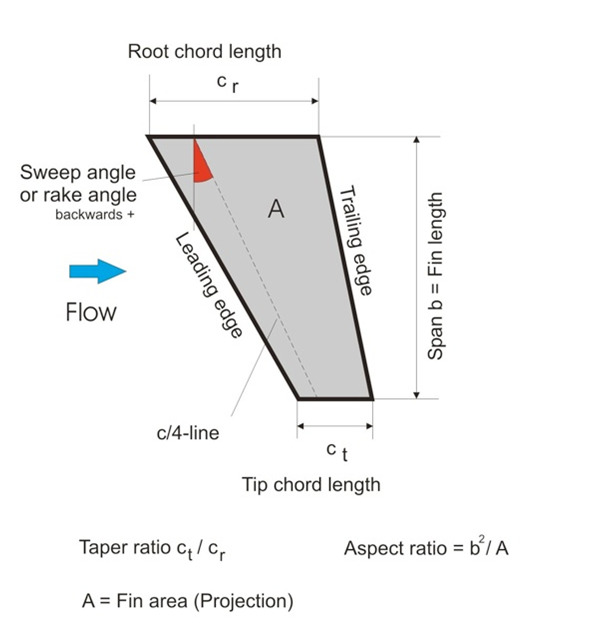 Typically, increased rake is associated with shorter fins, more manoeuvrability, and higher wind use; and lower rake fins are more often used for maximising power, particularly in lighter airs. However, these are not hard-and-fast rules and there are exceptions. Offers good durability / knock resistance and is an economical option that is easy to repair. G10 is a high-pressure fibreglass laminate composite material that is exceptionally hard wearing. 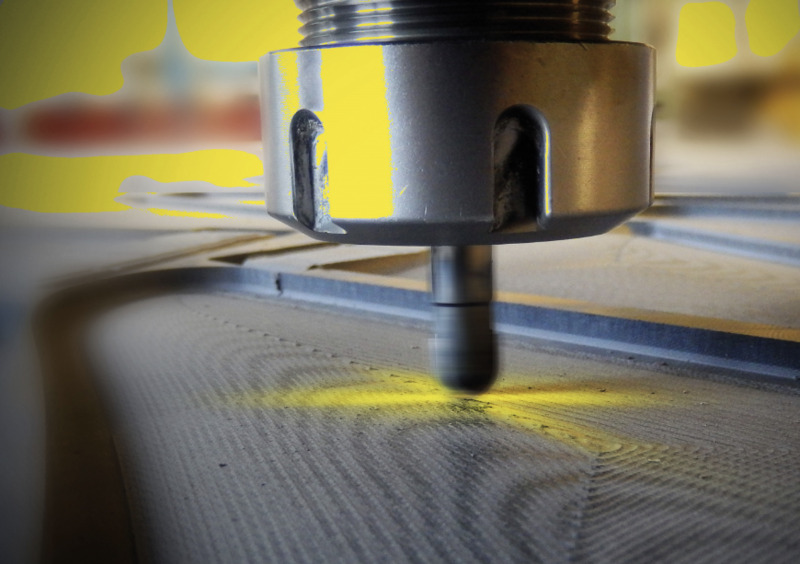 To be turned into a fin it is CNC machined into the desired shape. G10 is easy to repair and delivers a good balance between price and performance, although it can be a little heavy, especially in larger sizes (from 40-45cm). G10 is also by nature 'forgiving' in that moderately high levels of twist and flex help to deliver good control when overpowered. Speed freaks and experienced racers might find the slightly flexy nature a little ‘soggy’ and inefficient for their needs. The ultimate for stiffness and light weight performance, but with a higher price tag to match. Carbon delivers awesome lift, and allows for the creation of stiff and low twist fins often preferred by racers. Carbon fins are not necessarily hard to control though - it all depends on the intended use of the fin. The downside of carbon fins is that they are relatively more sensitive to knocks and minor damage. 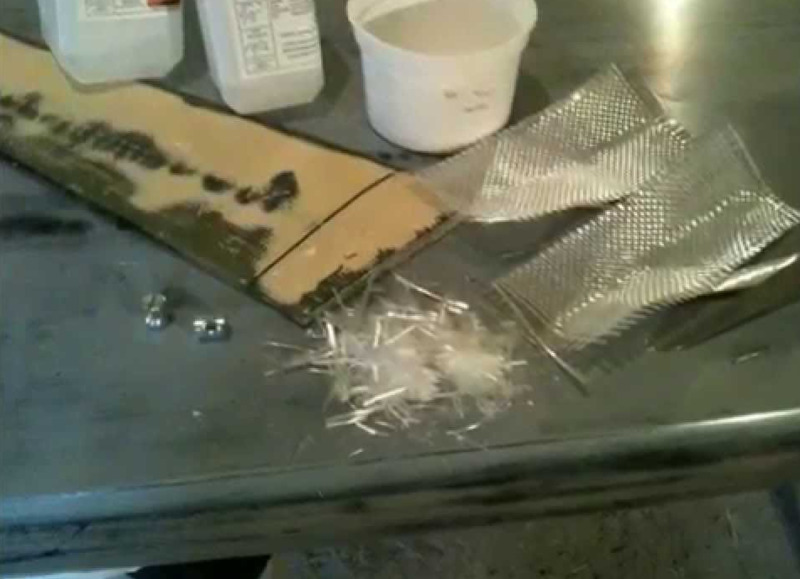 Typically, the structural materials used for RTM molding will be positioned in the mold and resin injection will follow.